Figures used in this chart are based on the most up to date estimate or projections by the national census authority where available, and are usually rounded off. Where updated national data are not available, figures are based on the projections for 2019 by the Population Division of the United Nations Department of Economic and Social Affairs. Because the compiled figures are not collected at the same time in every country, or at the same level of accuracy, the resulting numerical comparisons may create misleading conclusions. Furthermore, the addition of figures from all countries may not equal the world total. A handful of nations have not conducted a census in over 30 years, providing high error margin estimates only. Areas that form integral parts of sovereign states, such as the countries of the United Kingdom, are counted as part of the sovereign states concerned. Not included are other entities, such as the European Union,[Note 1] that are not sovereign states, and independent territories that do not have permanent populations, such as various countries' claims to Antarctica. Note: All dependent territories or constituent countries that are parts of sovereign states are shown in italics and not assigned a numbered rank. ^ The European Union is a sui generis supranational union whose sovereign members delegate to it by treaty certain powers that are often exercised by sovereign states. Its combined population has been estimated at 512,379,225 on January 1, 2018, and it would be ranked 3rd if it were included in the list. 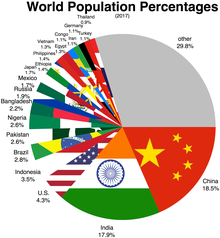 It has 6.65% of the world's population — see "Eurostat-Tables, Graphs and Maps Interface（TGM）table". European Commission. 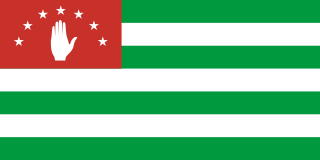 ^ Including the Republic of Crimea and Sevastopol, Russia's disputed administrative areas on the Crimean Peninsula. The Ukrainian government and many of the world's other states consider the Crimean Peninsula de jure a part of Ukraine's territory. ^ Population of the 18 regions of France. 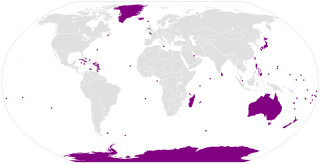 Excluding Overseas Territories and Collectivities: French Polynesia, New Caledonia, French Southern and Antarctic Lands, Clipperton Island, Saint Barthélemy, Saint Martin, Saint Pierre and Miquelon and Wallis and Futuna. ^ Excluding the 14 Overseas Territories and 3 Crown dependencies shown separately. ^ Excluding the population of the disputed territory of Western Sahara (Sahrawi Arab Democratic Republic). ^ Taiwan (Republic of China) also includes the minor islands of Kinmen, Matsu, Penghu, etc. The UN does not recognize the Republic of China (Taiwan) as a sovereign state. ^ "China's Population: The Most Surprising Demographic Crisis". The Economist. 2013. ^ "World Population Prospects 2019". This is a list of countries and territories by land borders. The number of unique land borders of each country or territory is indicated as well the names of its neighboring countries and territories. The length of each land border is included, as is the total length of each country's and territory's land borders. Figures for the population of Europe vary according to how one defines the boundaries of Europe. According to the United Nations, the population within the standard physical geographical boundaries comprised 737 million in 2010. 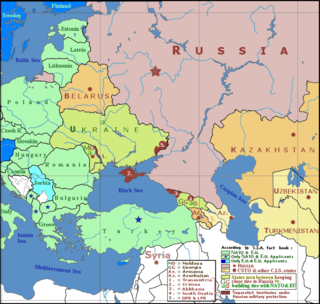 In 2010 the population was 711 million, defining Europe's boundaries as the continental divides of the Caucasus and Ural mountains and the Bosporous, and including the European parts of the countries of Russia and of Turkey. This list of European countries by population presents the list of 50 countries and 8 territories and dependencies located in Europe, broadly defined. Transcontinental countries are included if they are members of the Council of Europe. The constituent countries of England, Northern Ireland, Scotland, and Wales are combined as the United Kingdom.